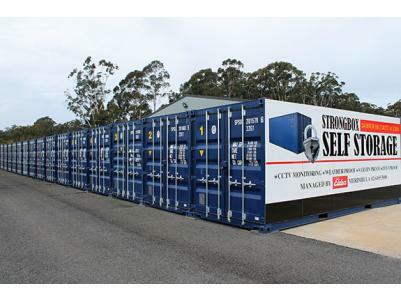 Strongbox Self Storage is a new facility located in the industrial area at 73 Redfern Close South Pambula. New 20 ft steel shipping containers with rubber door seals and raised timber flooring provide secure, clean, weatherproof, dustproof and vermin proof storage that prevents the contamination so often seen with other self storage options. Ideal for every situation from tradespeople to commercial bulk storage, document storage, household items, the possibilities are endless, you can have peace of mind that your items will remain sealed and safely protected. • NEW -- 20 ft steel shipping containers – available in full and half size. • SECURE -- With 24 hour security access, constant CCTV monitoring, security lighting and a lockbox protecting your padlock you can rest assured that your valuables are safeguarded to the highest possible standard. • CLEAN – Tight rubber door seals and raised timber flooring provide secure, clean, weatherproof, dustproof and vermin proof storage that prevents the contamination so often seen with other self storage options. • EASY -- Wide access and turnaround areas makes delivery, loading and unloading a breeze. Don’t risk your precious items in a tin shed! STRONGBOX IT! and have peace of mind that your possessions will remain sealed and safely protected. We are located opposite Bobbin Transport which provides a simple solution, if required, for all your transport and storage needs and wide, easy access makes delivery, loading and unloading a breeze. Our site is managed by Elders Merimbula. With competitive rates, discounts for longer stays and units ready for access today why not give Elders Merimbula a call on 64953000 and let us help you solve all your space and storage needs.